UMP | University of Minnesota Press Blog: Zombies. Sea monsters. A Fight Club. What the Dickens would Jane Austen say? Zombies. Sea monsters. A Fight Club. What the Dickens would Jane Austen say? Has the award-winning and highly Oscar-nominated The Kings Speech rekindled your appreciation for the British heritage film? You're not alone. Here, author Dianne Sadoff looks at pop-culture spin-off books, films, and other products of Jane Austen and Brontë sisters classics and what they say about American culture. Note: If you do nothing else this weekend, please please please join us in rooting for Colin Firth to *finally* get his due and win Best Actor on Sunday night (83rd Annual Academy Awards, ABC, 7PM Central). We don't want The Dude to rob him again. 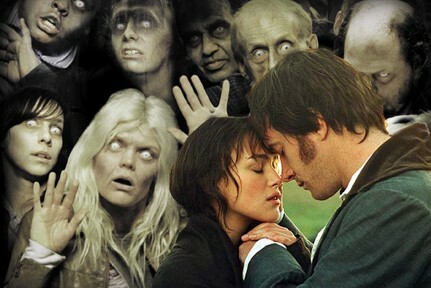 Spin-offs such as Pride and Prejudice and Zombies are proliferating. Dianne Sadoff looks at how this trend has gratified some tastes, upset others, and explicated a greater need in American culture. Image from Postertext. The arrival on the publishing scene of titles such as Pride and Prejudice and Zombies, Sense and Sensibility and Sea Monsters and Jane Slayer may well have given Jane Austen and Charlotte Brontë fans the creeps. Indeed, the proliferation of remediations, updates, and repurposings of Austen, the Brontës, and Charles Dickens, among others, means that franchising has reached into the canon in a way that readers of literary classics could never have expected. It’s a perfect time for adult culture consumers to start complaining about how bad these spin-offs and generic mash-ups are, even the ones we don’t yet know are in the pipeline. Those sequels, prequels, back stories, and faux biographies—from Julian Jarrold’s mixing of Austen’s letters with Jon Spence’s speculative and romanticized biography (Becoming Jane); to the sublime YouTube video “Jane Austen’s Fight Club” (see below), in which catty girls turn snide aside into punching match; to South Park's animated version of Great Expectations, Disney’s Oliver & Company, TBS’s Oliver on Family Guy, and Will Eisner’s graphic novel Fagin the Jew—may make you squirm, but, okay, when Oliver and Fagin’s gang become, respectively, kitten and dogs, you’ve got to wonder what’s going on in American culture. Is it the “rampant sequelism” that A. O. Scott identified as Hollywood’s “fundamental cynicism” during the summer movie season? Or is it something else? Yet, as I argue in my book, repurposing serves not only the culture industry’s mercenary motives but also gratifies the public’s taste. The current franchise expansion and sequel mania demonstrates the twenty-first-century desperation to sell product, given the dangers of online piracy and the economic crunch of the recession, as well as the public’s enervation and depression about the state of the nation’s culture. However, it also expresses the need to seek sensation, pleasure, thrills during the boom 1990s and the bust first decade of a new century. Repurposing attracts a new, wider, and constantly changing market demographic. Every few years, Lizzie Bennet needs updating for a younger teenaged-girl audience, and the new Austen mania solicits a different generation of female moviegoer than did the twentieth-century boom. Joe Wright’s film Pride and Prejudice, saturation-booked at multiple exhibition venues, opened during the all-important Christmas holiday season in 2007 and grossed $38.5 million on U.S. screens, repurposing Austen’s stories of status anxiety, estate envy, and acquisition of cultural goods and distinction via Lizzie’s girlish voyeuristic gaze. Wright added to Austen a romantic marriage proposal and a post-coital clinch for the increasingly global teenaged set. A new breed of actress, moreover, updates the Austen star image. Not Greer Garson’s Lizzie as the uppity broad of 1930s screwball comedy, whose skill and drive gained her power and admiration, whose snappish responses to gentlemanly snobbery subdued Laurence Olivier’s Darcy in every sexual battle; not Jennifer Ehle’s 1990s Regency Lizzie, walking Pemberley’s picture gallery and admiring its owner’s “regard,” or decorously flirting with upper-gentry, partially disrobed gentleman. No, Keira Knightley and Anne Hathaway instead bring millennial girlhood to the megaplex, updating the Austen countenance (even prettier in glamour lighting! ), youthful body (even slimmer yet with more breast exposed! ), and girlish pout (even more seductive while playing hard-to-get!) for the preteen set—or the all-important 14-24 demographic. And the even younger newcomer Mia Wasikowska, so thoughtful yet enticing in Lisa Cholodenko’s The Kids Are All Right and Tim Burton’s Alice in Wonderland, will be the next Jane Eyre, in Cary Fukunaga’s Jane Eyre, a heritage film scheduled for release next month that is written, directed, and acted by folks previously associated with mass-market potboilers. And what about BBC television’s “Masterpiece”? The new “Masterpiece Classics,” which debuted in 2005, updates the 40-year-old series, “Masterpiece Theatre,” which was admittedly beginning to look antiquated and out-of-date. “We’re not tarting it up or dumbing it down,” producer Rebecca Eaton averred, reminding older viewers and readers, already BBC regulars, that the adaptors remained faithful to their Austen. Yet Andrew Davies, who penned four of the six fast-paced Austen teleplays, added to his scripts the suppressed scenes Austen couldn’t quite write: he invents little scenes of kidnapping and B&D that Catherine Morland “makes up for herself” in Northanger Abbey, opens Sense and Sensibility with a seduction scene that Austen only reported late in the novel as (nevertheless) consequential backstory. Seeking multiple audiences, these post-classic serials eschew the faithful transcription of dialogue and narratorial discourse that once constituted Austen adaptation. Whereas Fay Weldon lifted dialogue from the pages of Pride and Prejudice, “adding and subtracting scarcely a word” for her 1980 dramatization, Davies confesses he likes a “bit of bodice ripping” in updated millennial romance. But ask any parent, and he or she will tell you how hard it is to get kids to read, that as long as they consume something—and especially if it’s the “classics,” even in mash-up print or movie version—it’s a cultural good. So, as vampires keep recruiting new undead and zombies new corpses, the classic fiction of nineteenth-century Britain rises from the cultural grave to seek new consumers. Sequel mania, appropriation and repurposing, franchising and branding give the canonical British novel new life, even if only in pulp fiction or at a megaplex near you. Paradoxically, American culture cannot do without them. Read more in Victorian Vogue: British Novels on Screen, by Dianne F. Sadoff.